When I started this blog, it had no very defined purpose. I thought I might write about writing, and maybe drop in a little tidbit here and there – about some of the books I’d written. The publication results, carefully logged inside of the statistics database, and accounting for more than a year of operation – have been very informative. The blog became a catch all bag of stories, hodge-podge and randomized to the extreme. This intentional lack of planning acted as a honey pot, collecting some very good information in the logs. Occasionally, some poor soul stumbled by, intent upon taking a look at a page I’d written. Most usually, this person had drifted onto my site by way of Google, and occasionally by the indexes of Yahoo. Typically once, but sometimes twice a week, I was accustomed to seeing visitor’s traces appear in the log. By the way, the log keeps no PII (personal info) … but instead just a date stamp and pages visited. As far as I know. The striking thing about the information i found in the logs … was that visitors never clicked a second link in the blog. A look at the statistics proved this phenomenon to be pretty universal, relative to the folks I noticed visiting my blog space. It seems in retrospect, a self-fulfilling sort of thing. My blog is hodge-podge, with not very much of any one thing. A lot of it is “in the moment” stuff that may have seemed relevant at one instant of time, and interesting enough to make a note about – but of little interest to the wandering nomads of internet search engines. As I began to realize this phenomenon was a show stopper for visitors, I started to split some of my doings off from the potpourri I’d created on WordPress site number one. I started dumping some of the artsy-craftsy stuff over onto Ronscheckelhoff.tumblr.com, and some of the techie stuff onto a second WordPress site (Codekradle.wordpress.com). What I’ve done here may be convenient for me, because I can write without consideration for what is likely to attract visitors to the site. If I want to blog into the void, that’s fine. But, it’s a poor way to write a blog if the expectation is that others are to be induced to visit it. It looks like a blogger should pick one or more idea-specific blog purposes, and build a single blog site for each venue of interest. Intuitively, if visitors come looking for “xyz stuff” – then providing more “xyz stuff” may keep them around to look at additional material. Otherwise, they’ll sail off after a single click. Duly noted. Wonder why I selected the graphic? I guess I was too lazy to make a pic more closely related to the theme of the article. 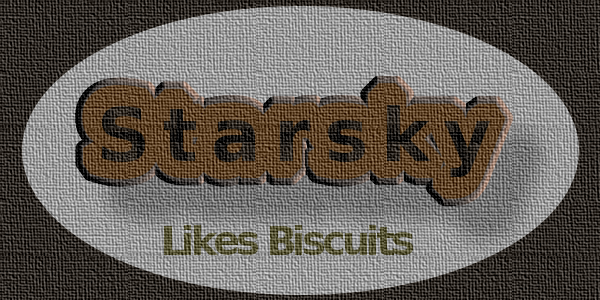 I created Starsky’s Biscuit for the hell of it, yesterday, and uploaded to tumblr. Anyway, a plain page is just too ordinary. I like primitive things, but primitive can be interesting. Headerless pages are just boring. If you want to make a biscuit, I’ll tell you how Starsky’s biscuit was made. For the biscuit itself, I used Xara. For the texturing, I used a very old version of Gimp and its “artistic canvas” effects script. Go have at it!